It's always fun at the river! 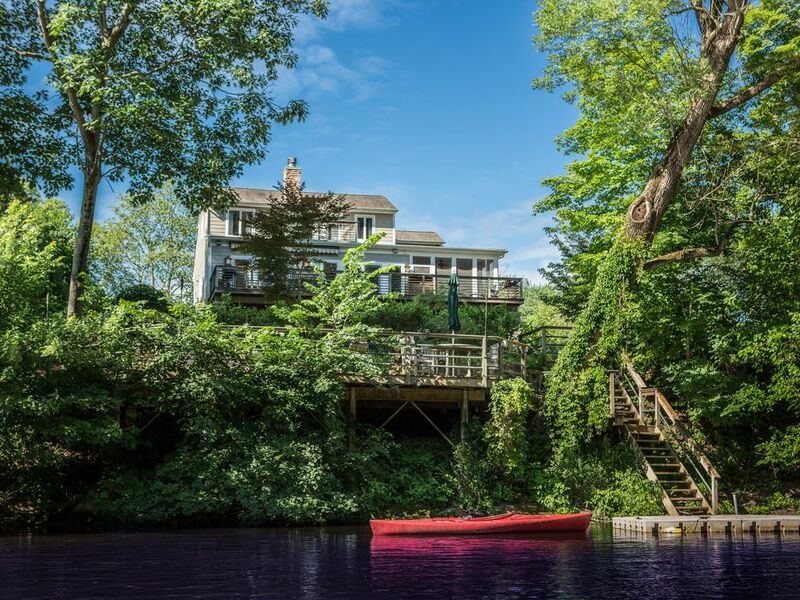 Whether a romantic get away or action packed adventure is your goal, this river home is your ticket to relaxation. The hardwood floors and stone fireplace enhance the home's cozy and warm atmosphere making you feel far away, even though you are only 1 1/2 hours from NYC. Relax by the wood burning fire, and enjoy the bright airy feel of the home and the spectacular view of the river and the Palisades mountains. Swim or fish off the front yard dock. Chat around the fire pit. Canoe, kayak, and bikes are available to you. Walk, bicycle, or cross country ski on 60 miles of tow path, right in the back yard. Or explore all that Bucks County has to offer. Young families may enjoy a visit to Sesame Place, Ringing rocks or the Crayola Factory. Master bedroom is located on its own separate floor. Canopy bed. Gas fireplace. Deck. Jetted tub for 2 overlooking the Delaware River. All enhance the getaway experience. 2 additional bedrooms each with attached full baths. Discerning chefs, and families alike, will enjoy the spacious gourmet kitchen and bar area. The open family room leads out to a 45' deck and a screened in porch. Kitchen and family room share a see through, wood burning, fireplace. Easy access with 3 floor elevator and 3 car garage. If you are interested, please indicate your telephone number so that we may discuss if the house is a good fit for you. 6 adult and 2 children's bicycles. No private pool, but excellent swimming in the river, right in the front yard. Joan thinks of everything and her home is terrific! We look forward to returning next year. We spent 5 days in the area for a family wedding and reunion. Our family loved the house and the location is fabulous with a beautiful spot on the Delaware. The house had everything we needed. Joan was very helpful to recommend shopping and dining nearby. We will definitely be back to enjoy the autumn foliage or summer next year. Beautiful house, Very relaxing, Every amenity, Wonderful owner! A great getaway spot. Good restaurants, nice people, and an amazing river. We had an amazing girls weekend here! My girlfriends and I booked this house for a friend's 30th birthday and we had such an amazing time! I only wish we stayed longer! The house was stunning and you just could not beat the location! Joan was so incredibly helpful with all of our preparations for our trip and even helped us pick out some restaurants to visit. :) I can't wait to bring my husband and our son back to the house in the future for a family trip! We had an absolutely wonderful experience at this rental! The house was as lovely as it appears in the photos. It’s beautiful, cozy, and has all the right touches to make it the perfect home away from home experience. We were two families with a total of four kids (ages, 4, 3, 1, 1), and the house was very family-friendly and safe (and easy) for our group. Amenities such as high chairs, pack-n-plays, mini-bikes, etc were available in the house and in excellent condition. The owner Joan was incredibly professional. She was highly responsive, made sure we were happy with our stay, and went above and beyond to make sure all our questions were address. We enjoyed how conveniently located the rental was to the General Store and surrounding towns with restaurants and shops nearby. I highly recommend this home and would happily stay here again. Beautiful home, the kitchen was well equipped and great to cook in. Comfortable beds, accessible for chair users with the elevator and ramp from garage was appreciated. Loved the walks along the canal and the location of the house.